Samsung has disabled an advanced search function in an update to the international version of its flagship Galaxy S3 smartphone, following a patent dispute with Apple. Once the software is installed the phones no longer search contacts, apps and other on-device material using software developed by Google. Android Central, which revealed the news , noted that users were not told the update would disable the service. It follows a similar move in the US. Apple claims the innovation infringes its patent to a single search interface which it uses in its Siri app to collate results from a range of sources. The iPhone maker had already managed to enforce a brief sales ban on another Samsung handset - the Galaxy Nexus - in the US because of the patent. That dispute will be considered again by a Washington-based court on 20 August - but whatever the ruling, it would not have applied to the GT-i9300 (S3) model sold in the UK and other places outside the US. A spokeswoman for Samsung was unable to provide more detail. "Samsung may be doing this as a precautionary measure to prevent it having to pay damages on devices sold outside the US in case Apple prevails in the States and then pursues a similar suit elsewhere," said Simon Clark, head of intellectual property at law firm Berwin Leighton Paisner. "Generally speaking a multinational company like Apple will have patent protection in all its key countries, and the wording will be very similar in each area. Although patent law can vary across territories it's quite likely that a ruling in one country will lead to similar decisions in others." The move marks the latest development in a long string of lawsuits between the two firms over the technologies and designs of their mobile devices. Apple was defeated in a London court earlier this month when it tried to have Samsung's Galaxy Tab tablets banned in the UK after it failed to convince a judge that the South Korean firm had copied the look of its iPad. The California-based company was ordered to publish the fact that its competitor had not infringed its registered design on its website and in magazines as a consequence. 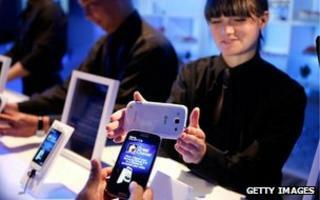 However, it was more successful in Germany on Tuesday when an appeals court in Dusseldorf extended a preliminary injunction against Samsung's Galaxy Tab 7.7 across the EU because of a related claim. The two firms are set to clash again in the US on Monday when a jury will hear patent infringement suits filed by both companies against the other. According to a court filing posted on the Foss Patents blog , Apple is seeking $2.5bn (£1.6bn) in lost profits and royalty fees but is offering a fraction of that amount - half a cent in damages for each handset it has sold that uses its rival's technologies - to settle Samsung's countersuit. Samsung later responded with its own filing, alleging that Apple was trying "to stifle legitimate competition and limit consumer choice to maintain its historically exorbitant profits".